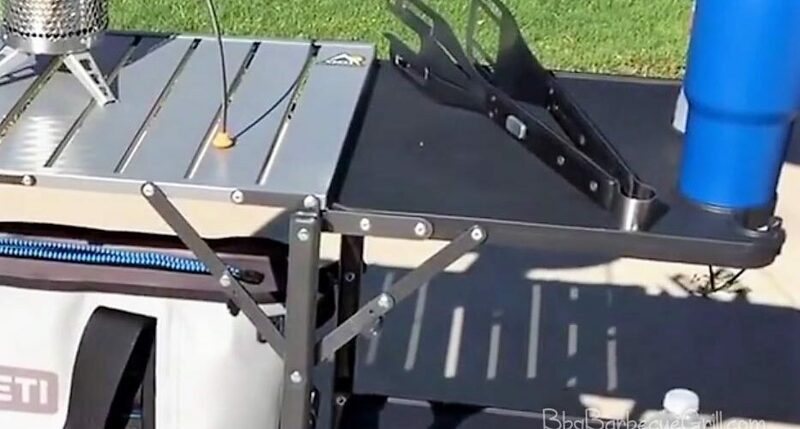 Going for the camping or tailgate then you’ll be thinking for a portable yet slim and sturdy cook station that can keep all your utensils, pots, stove, paper towel and any other accessory item together in a big surface area and can be sufficient for making your picnic worth remembering and great. If you wish to have that outdoor cook station, then you are lucky enough as this is available on the market with the name of GCI Outdoor Slim Fold Cook Station. The product has the full potential to be your best purchase ever. The GCI Outdoor Slim Fold Cook Station has the most positive words of mouth, due to its state of the art design known as SLIM-FOLD and extra storing capacity. It can turn every stone unturned with its durability and highly satisfying performance. The design is robust and constructed with such a high intelligence that it can be set up or break down into the one piece in few seconds. It will have everything for fulfilling your camping needs. GCI has built the frame of their cook station with the higher power coated steel, which is sturdy enough of bearing all the weight of your tools, or items. The counterpart has the aluminum that is heat resistant. You can place your partially cooked food or grills there without worrying about any structural damage to your cook station. Moreover, it comes with a handle that can aid in carrying it from one place to another during transportation. The product has compact design (20.9×3.7×34.6 inches) and can support the 203.5 lbs weight. It has a larger surface area for keeping all your required tools together. It has one lower rack and four sides out table made with the plastic. The side tables also have some other great features like possessing beverage holders, hooks and stem glass holder. The GCI Outdoor Cook Station weights 19 lbs and can handle the weight up to 300 lbs that is enough even for the big families. It’s one piece design, and SLIM-FOLD tool makes it be the first on the checklist when you plan for an outdoor get together or camping with your friends or family. The product has light weight but can tolerate a significant amount of weight. It has heat resistant material hence it’s safer to place a grill on it. It has fold up and fold down design that works in seconds, and once it is folded up, it provides vast space for carrying all your tools in its storage racks. The handle helps in easy moving it from place to another. It is made using SLIM-FOLD technology. The upper or cook table sometimes feel to be a bit slippery. It can get rusted when put outside in the weather. GCI Outdoor Cook Station holds everything you may need for the picnic. It’s sturdy one piece design with its light-weight feature make it a great deal for outdoor parties or picnic. The impressive cooking along with the vast storage option are the real deal makers. It is built with the high-end material that provides services for years after years.